I've been trying to actually use my Cozmo cards, so when I had to go to LAX I decided to try out Baby Blues BBQ in Venice. The place was crowded and loud - typical small BBQ joint. I was excited that they had sweet tea!!! It's hard enough for me to find ppl in LA who even KNEW what sweet tea is. We decided to share the Blue Devil plate which gives you 4 meats (although Texas and baby back will cost you extra :/), corn bread, and 2 sides. 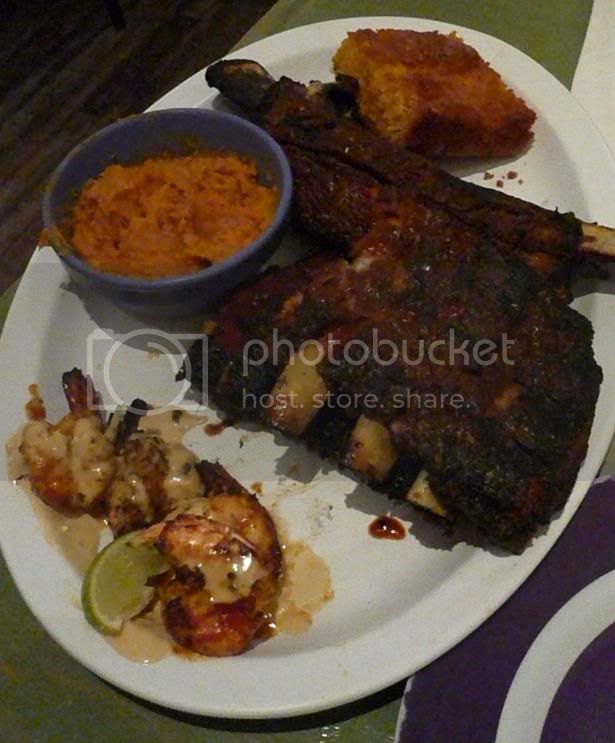 We got the Texas beef ribs, Memphis ribs, baby back ribs, and shrimps - with sweet potato and corn on the cob for the sides. The corn on the cob was sweet and moist. 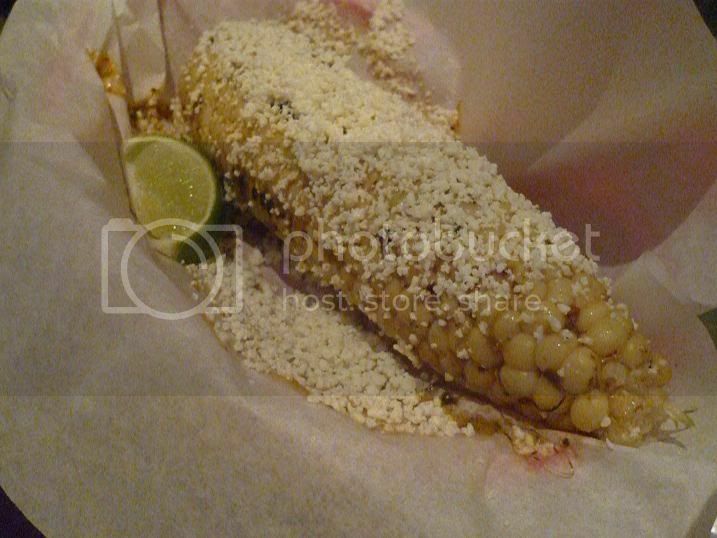 I initially enjoyed the blue cheese they put on the corn, but after a while it was too much for me and I really just wanted to taste the sweetness of the corn itself. The ribs were all great. 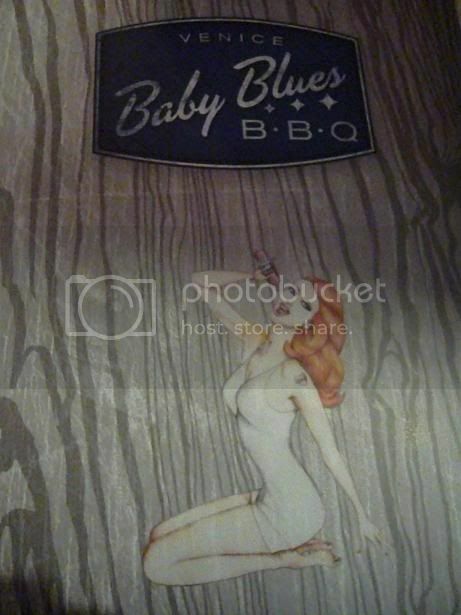 Pretty tender with beef < memphis < baby back in tenderness. Now, to show you the differences between the ribs, here are the bones, from top to bottom, of the Texas style beef ribs, then the baby back ribs, followed by the Memphis style long bone ribs. See the size differences? And the curved bone of the baby back! In an attempt to hit $50 so we can use our cozmo card, we ordered two desserts: the banana pudding and pumpkin-sweet potato pie. 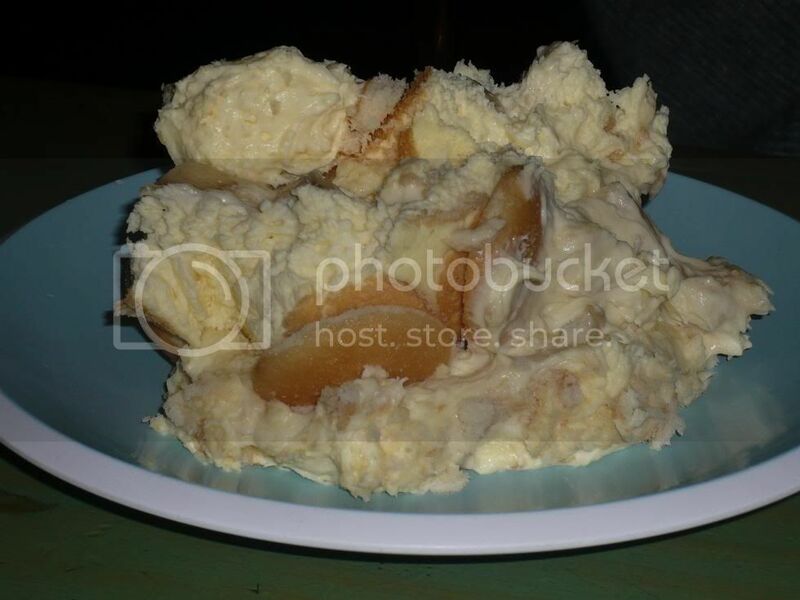 I think there's too much starch in this pudding and I didn't really like the texture - too sticky. 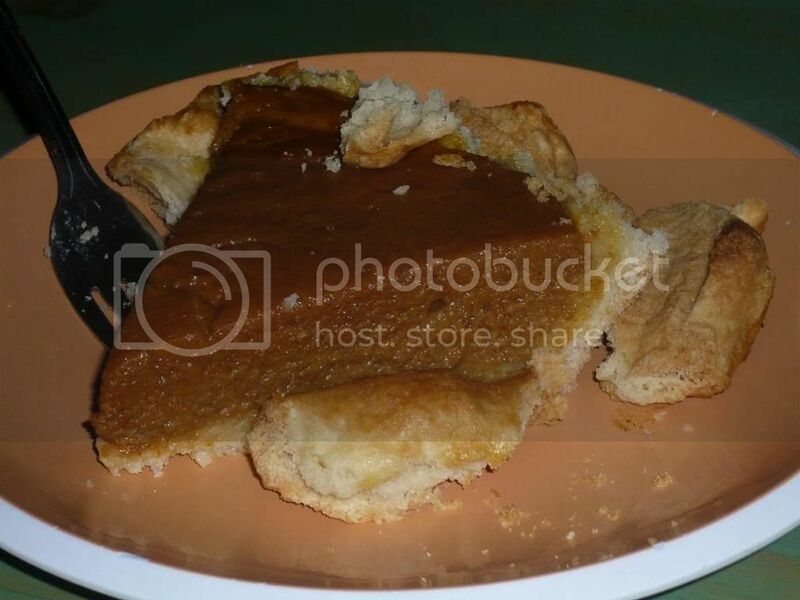 The pumpkin sweet potato pie was good, although very rich. 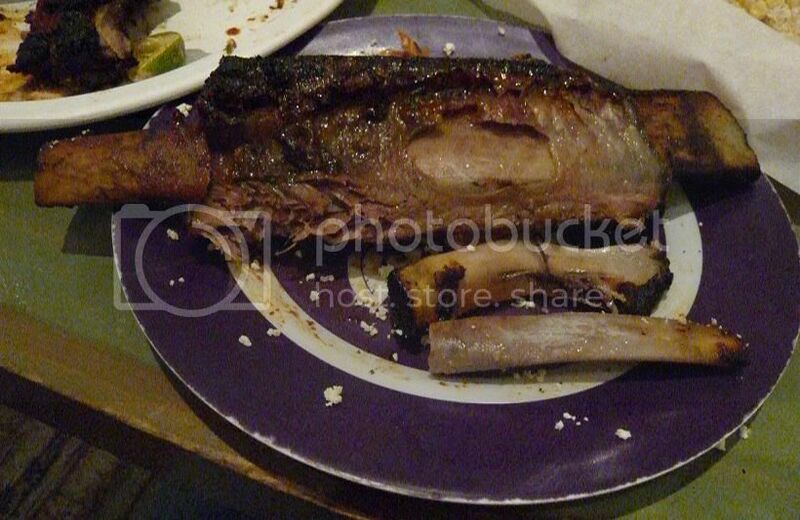 The ribs here are tender and had great flavor, and the ambiance was pretty cool. I still like Tony Roma's for bbq. It's hard to find a really good place. Going in a different direction... Have you tried Jin Patisserie on Abbot Kinney in Venice for its quiches and salads and desserts ? it is wonderful ! I haven't tried Tony Roma's for its bbq ... maybe I'll do that. The LA BBQ Fest was one of the worst barbecue experiences, ever! Almost all the 'cue was sold out, and what wasn't sold out tasted lousy. Sounds like a decent experience at Baby Blues. Every dish sounds over the top. I had much better success with the sides than the 'cue when I ate there. Baby Blues is fine as far as L.A. barbecue spots go, but considering there isn't a single serious barbecue establishment in the city, it's normally worth just sticking to other kinds of food. Would you eat at Baby Blues again without a Cozmo card? Wow that stuff looked good. I had heard some good things about Baby Blues. Guy from Food Network went there for Diners, Drive-Ins, and Dives back in the first season. Thanks for the write-up. I stuck to out of town places at the BBQ Festival, so I wasn't able to get a sample of Baby Blues. 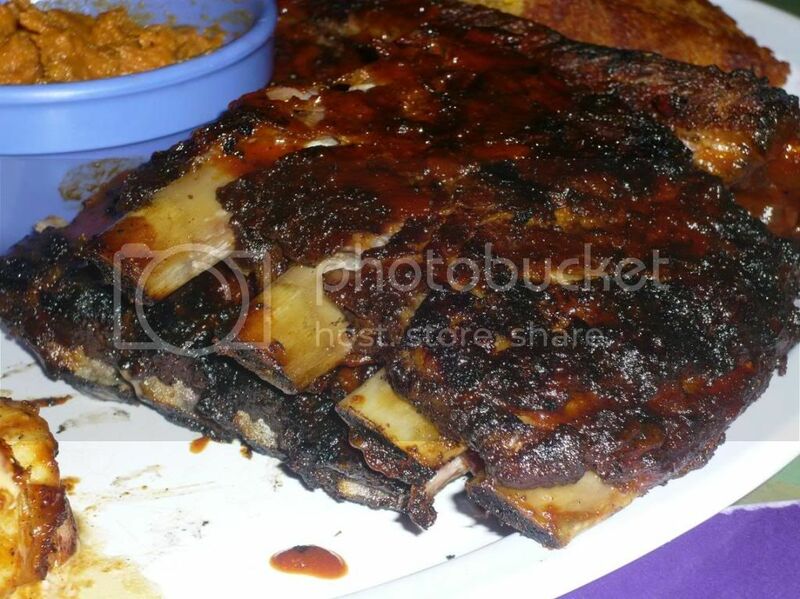 Did you prefer the beef ribs or the baby backs? I know the baby backs were more tender, but does that also mean they were tastier? Aaron: I have to say I personally preferred the baby back and did think it was tastier.